Tender (tropical) bulbs. I toss my tropical Narcissi, too. These are hardy only in zones 8-10. I live in (frosty) zone 5-b. Still, because of the gorgeous color and scent they bring to my window garden, I don’t mind buying the bulbs year after year. Pictured above is the sweetly-perfumed ‘Winter Sun’ — my favorite among the tropical narcissus clan. And all kinds of cold-hardy daffodils, including the heavenly-scented Narcissus ‘Erlicheer’ pictured above. 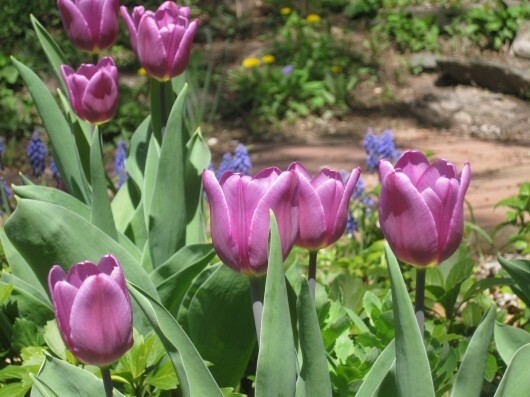 To make these bulbs worth saving, it’s essential to care for them after their blossoms fade. Cut off the dead flowering stalks, but do not remove the green foliage. Foliage is necessary for photosynthesis — the conversion of sunlight into sugar. Provide full sun, cool temperatures (65 degrees maximum), and plentiful food and water. After several weeks have passed, yellowing foliage will signal the bulb is ready for a rest. Withhold all food and water. And by the way, a tulip with yellowing leaves is not an attractive sight in a window garden. I let my bulbs ripen their foliage under a fluorescent light unit in my kitchen. Mercifully, my kitchen is not on “public” view. Once the soil has dried out, cut off the withered foliage. Then remove the bulbs, and place them in a paper sack filled with sand, sawdust, or some other dry medium. Or, do what I sometimes do, and let the bulbs remain in their pots. Transfer the bag or the pot to a cool, dark, and dry location for the remainder of spring and summer. Be sure to label the bags or pots. There is nothing worse than finding bags or pots of bulbs in the fall, and not having a clue as to their variety or color. Well, I don’t like surprises. In autumn, plant the bulbs in some sunny location outdoors. There, within two years time, they will flower as freely as though they had never been seen in a window garden. Was this tutorial useful to you? Perhaps you can let me know by leaving a comment. 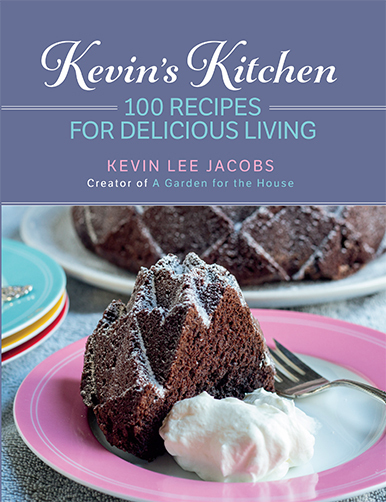 Don’t miss anything at A Garden for the House...sign up for Kevin’s weekly newsletter. I was just searching the internet for this very topic!! When I couldn’t find it I remembered your website and thought you would definitely have some article on this. Thank you very much! Rinnie – Welcome. So glad this article came to you at a crucial moment! Question: what is a good light bulb , type and potency, for houses plants and flowers. I love in the same climate zone as you and find that the natural light I’d not enough. Hi Kelly – I use ordinary, “cool white” fluorescents. You can find these at any hardware store. African violets, geraniums, and other flowering plants thrive beneath the “artificial sunlight” the fluorescent tubes afford. The lights are really cheap, too — about $4.00 for a pair. very very useful information here for me! Gotta try some fragrant bloomers next year… ohohoho! I was just wondering about my tulip bulbs this morning. I forced them in water, but I’ll know better next year! Great info…Thanks for the post! I have some tulip bulbs right now that I was going to plant…now I know! What a lovely set of pictures, and I could just smell the sweet scents of your window garden, Kevin. How fun. 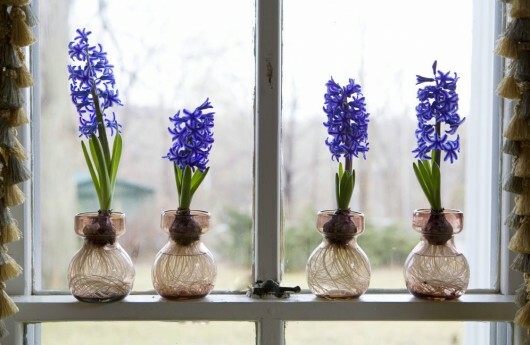 You can bet I’ll be forcing some hyacinth next year in MY garden window. Great info. Yesterday I went looking for tulip and daffodil bulbs to plant, but couldn’t find any. And the stores couldn’t even tell me if they had seen any yet, and figured they just haven’t come in yet. I told them “But the ones that I have already are 5 inches up out of the ground!” So I started to consider buying the ones they get in that have already bloomed and plant them in my front yard – whenever it is they come in to the store. So my question is….Will these stay alive and will they produce next year? 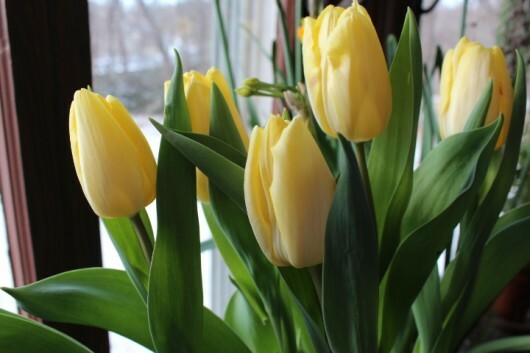 Hi Joelle – Tulips and daffs are usually only available September-December (they are autumn-planted bulbs). 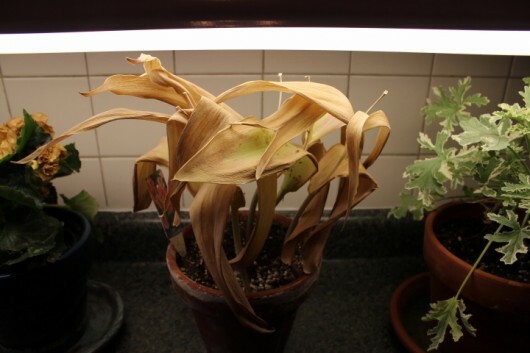 If you buy already-forced bulbs now, my advice is to feed and water the heck out of them until the foliage naturally withers (as described in the article above). Then plant them out in September or October. If they don’t bloom for you the first spring, don’t despair. They are merely convalescing, and will bloom the the following year. Great article! super useful and very timely, Kevin, thanks for taking a complicated topic and making it very easy to understand. I’m curious, do you ever fertilize after forcing? Would that help these depleted bulbs bounce back? I have a house full of bulbs that I had forced last winter, stuck outside in the pots for spring and summer, then topped off with compost before cold-treating them again. The daffodils sent up lots of foliage and quite a few blooms. The muscari bloomed like crazy (still at it!) and the hyacinths did well too. The tulips didn’t show but I suspect the bulbs were eaten by some enterprising little rodents over the course of the summer. I think the level of success I did have was due to a late start pulling them out of the cold last year…they were blooming only slightly ahead of the outside bulbs. That and the hard to kill nature of the grape hyacinths! This year I’ll get them in the ground and start some fresh new bulbs for forcing in the fall. 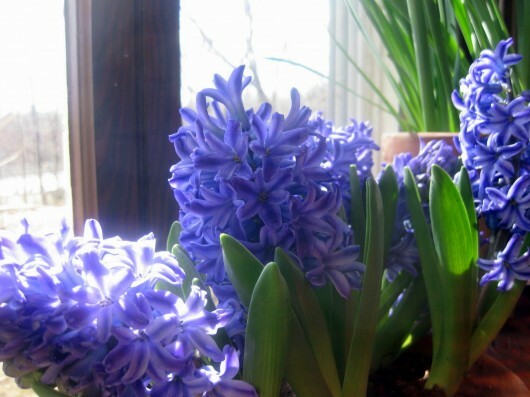 Sheri Rice – I’ve tried feeding my water-forced hyacinths, and they still refused to grow (let alone flower!) after being planted out in the garden. You might have better success than me. On the hand, all of my soil-forced Dutch bulbs — which I feed regularly after flowering, as described above — have had productive careers outdoors. Honor – Congratulations on a job well done! Letting the potted bulbs ripen their foliage outdoors is a big, big, plus. Badger gardener – Happy spring to you, too. Same (dreadful) weather here. But the robins have arrived — one is pecking at my ice-cloaked crabapple tree as I write this — what a comforting sight! Great tutorial; especially helpful to sort out the differences in ways of forcing bulbs. I have a question. I did not get around to replanting the tulip bulbs I pulled up this time last year, 2012. Should I throw them out? Should I plant them this fall? Should I plant them now? Now I have to go to my kitchen and make a couple of your recipes! Hi Judith – If the bulbs are still plump and firm, I’d go ahead and plant them. And remember: no expectations, no regrets! Over the years my puschinias have greatly increased outdoors I am wondering if I could take some of these bulbs from the yard and force them to bloom indoors. 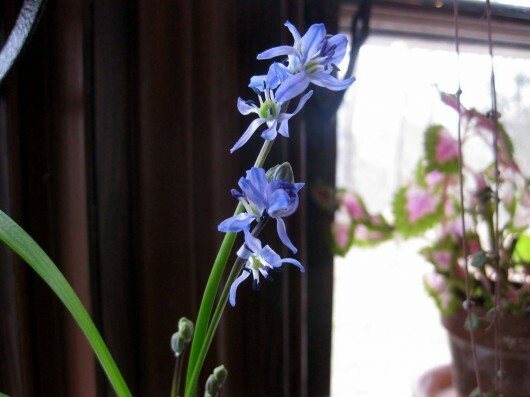 Hi Henrietta – You can absolutely dig up some of your puschkinia and force it for indoor bloom. Have fun! Kevin, this is exactly the information I’ve wondered about. Thanks so much for posting! I used to work in a flower shop and would take home all the pots of forced bulbs that had ‘gone over’ and were not saleable. However, I used to plant them outside in the spring as soon as the ground was workable. If I waited to the fall, I could never remember where the holes were, and would always end up spearing some bulbs. Kevin, I’ve planted my water-forced narcissus, and they bloom. It may take a couple of years, but eventually they produce year after year. I just figure, heck, why not give it a shot and plant them? Thank you for the good information and for another view into your lovely home. Interesting. I was told that no forced bulbs would ever grow or flower again if planted outdoors. A couple years ago, I was given a pot of gorgeous white tulips for my springtime birthday. Wish I had known this then…they’d be out in my yard right now instead of thrown away. Ah well. Forcing bulbs is on my list for next winter. Good to know that they aren’t necessarily one hit wonders. So what if I plant them outside right away in the spring and let the leaves die off there? I know the hyacinths do well this way. Louise – Great to know that you’ve had success with water-forced narcissus. 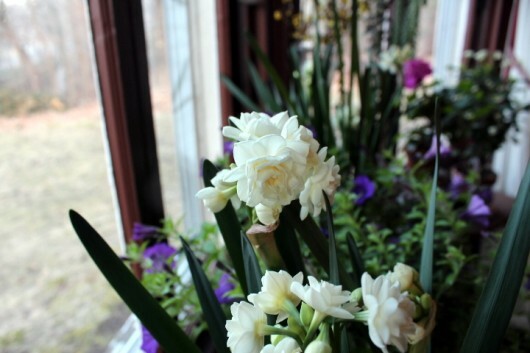 Karin W. – If the weather is “spring-like” where you are, you can indeed let your forced bulbs ripen outdoors. One of the local stores have the most gorgeous pots of spring flowers that I buy for very little and once they’re past their glory, I do as a few others do.. I plant the whole ball of wax in my perennial garden once I can get outdoors in the spring.. Most come back beautifully.. Some of the hyacinth are wimpy for the next year or two but they eventually made a great showing. Deborah Kilbourn can empathize with the squirrels. They also forget where they buried the bulbs. Sometimes that is to my advantage; my bulbs travel all around my garden with no work on my part, thanks to the beasties. They even planted a Paulonia tree for me. I was just wondering about this yesterday! Thank you for answering my question 🙂 Although, I was hoping I would be able to reuse the bulbs for indoor blooming. I had bought potted tulip and hyacinth just pre-bloom from a store and am enjoying their company, but it sounds like they are destined to decorate the outside of the house in a few years. Thanks again for your perfectly timed advice. Thank you so much for this information. I’ve never known what to do with bulbs so stayed away from them even though I love their flowers. This has been a great help! This article is very timely! I have tulips that bloomed in water and have been wondering what to do with them. So I guess I might as well just toss them. I’d hate to put them in the ground and watch and wait! I had planned to plant them outdoors but, sad to say, sometimes it is better to start fresh! what about little baby bulbs that are growing from the mother bulks in water ? to plant next year ? (Zone 8) and they produce lovely foliage but no flowers. I brought them in this year and they bloomed . Next year I will bring them in sooner to get them blooming by Christmas. I was given a Star of Bethlehem this Christmas and will put it out as well. No info about sun needs. Full sun like most others?? Love this site and your expertise. I use a lot of the information. Ooops that would be Zone 8 !! Just enjoyed a summer dinner special thanks to your tip on freezing yellow squash. Love it. Now making zucchini bread for Easter week- end from the same hint. Your caring for keeper bulbs tutorial was very helpful. You are a good teacher, pleasant, encouraging and informative. I appreciate knowing for instance that some flowers need the freeze and thaw action to get going. As a violin teacher my goal is to help people approach what they expect will be difficult with a cheerful confidence, armed with information. That is just what you are doing for me in areas where I’m a bit afraid. What would you do with paper whites? Thanks much! I want to plant bulbs and put mulch down and I “HATE” using the black plastic. I’m afraid bulbs won’t come up. Can I cover with mulch & how much mulch to keep weeds out but let bulbs thru? Rachel Burger – Paperwhites are tropical narcissi. Because the bulbs are not hardy in my zone, I toss them after their flowers fade. If paperwhites are hardy where you live, then by all means plant them out. Jan Holmes – For a weed-barrier, I use newspaper instead of black plastic (details here). Easy enough to plunge a trowel through the paper at planting-time. How thick a mulch depends upon the kind of bulb you are planting. I’d use a 2-inch layer of shredded mulch for major (large) bulbs; and less for minor (small) bulbs. Since you mentioned shredded paper, I just ordered a shredder for leaves and small twigs to try and speed up my composting. Do you think such a shredder could work with newspaper and hay or do I need separate shredders for each item? Hi Enid – I did not mean that you should shred the newspaper. The mulch that you place atop the paper should be a shredded-type (as opposed to a chunky, bark-type). Thanks, Kevin. I have always wondered how this worked. You made it so simple. What to do with some gorgeous Amaryllis bulbs? They bore 4 huge blooms and are now lying on their side outdoors here in Oregon. How to get them ready to bloom again for Christmas? I ordered them from Van Engelen. I have taken your advice and started several seeds in milk bottles. What I want to know is how do you know when to transplant them? Do you transplant them straight into the garden and also, do you thin them out whilst they are still in the bottles? I live in Illinois, which I think is zone 5. 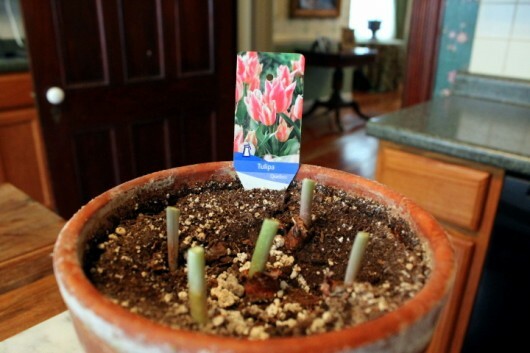 Janet – Here’s my Amaryllis How-To. Ann – Here’s my guide to Transplanting Winter-Sown Seedlings. Yes, very useful information, thank you! I had very good luck with forcing bulbs indoors this winter. Generally, I just toss the forced bulbs into the compost. I’m experimenting with the paper-whites, keeping them watered and fertilized until the foliage dies, to see whether I’ll be able to get anything out of them next year. I have my doubts, but weirder things have happened! I’m happy to have found your site. I live in NE Pennsylvania, near Scranton, so our climates are similar. Perfect. I followed your suggestions and had a house full of blooms this February and can looking for what to do next. I knew I could count on you! Excellent information. Just what I was looking for. My husband bought me some forced Tulip’s for Valentines Day and they were Beautiful. However, they were forced in water and I didn’t know what to do with them this Spring. I am a little disappointed that you recommend in throwing them out. But, I certainly don’t want to waste my time if they’re not going to bloom in the yard. So thanks for the info and I look forward to receiving your newsletter. I am an avid gardener, it’s my Therapy. Thank you for this informative post. We have just moved into a house and now I have a yard once again after a few years of doing without. I bought bulbs last week with the intention of forcing the narcissus ones. It’s been a while since I have had dirt to play in, and your post was well timed and motivating. Great tutorial! Great info , thanks Kevin. I have always loved plants and flowers, inside and out, but my gardening has been so very hit and miss. I don’t really know what I’m doing and I find most sites overwhelming with SO much information in a single post. I found your post informative, with down to earth information and advice. And for the first time I feel like I can tackle forcing bulbs indoors and then have some idea of which ones I should plant again outside. The addition of pictures and types was the perfect addition and even how to prepare them so that they will be successful when planted outside. I can’t thank you enough for sharing so many wonderfully useful tips without overwhelming me with technical jargon about pH and soil blends and “feeding” rituals. I realize those things are necessary for success, but too much at once is like sitting down to a dinner with 6 meat dishes and 15 sides … delicious, but overwhelming! 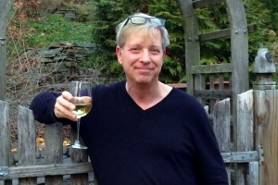 Thank you again … love your site and love your emails! You blow my mind! When I think that there are no longer any magical moments in this world of ours – I recall your beautiful, healthy, compassionate, and loving home; and all that you do. Thank you for sharing such beauty with the world. When I read above about “tossing bulbs” I must say I developed a lump in my throat. I am creating Natasha’s Memorial Garden here on the Olympic Peninsula in Washington State. I have a strong propensity for not throwing anything away…even if it looks “gone.” Please send me your tossed bulbs and I shall plant them in an area of The Garden (Kevin’s Garden) and allow them to grow naturally, whatever shall, for the next, say, thirty years! I shall send you a picture every year! Thank you for linking to this article again – I thought I remembered you doing a piece on forced bulbs, but wasn’t able to find it amidst my bookmarks! Kevin have loved reading all your articles. Have you ever forced bearded Iris’s? I have some bulbs that I did not get out last fall, but want to keep. Can you help? Bulbs are my favorite plants. Thanks for sharing. I’ve had a few fails over the years on saving bulbs after blooming. Thanks again for all the valuable information you give us. Thanks, Kevin! Just what I needed to know. Next year pots and soil! Great post! I have some store bought tulips i would like to try to save/reuse. Genius! Wondered on the subject for years. Thanks for helping alleviate my guilt for the throw-always and sharing options for keepers! Thanks so much! Just the information I was looking for. I’ve enjoyed my forced narcissus so much this year but they are almost done, just a stray flower here and there amongst the crinkly ones. I planted some in the yard about 5 years ago and only this year did I get one flowering stem. After planting them I read that they probably wouldn’t flower again so it was a nice surprise. Now after reading your post, I know why (but it still kinda hurts to think about trashing them!) Your post was very informative with inspiring pictures, thanks. I’ll explore your website more later…. Kevin – I followed your instructions to start tropical narcissus bulbs before Christmas in pebbles and water. They sprouted and grew about 2 inches, then totally stopped growing. Not dying, just doing nothing! What can I do?? I live in central Florida. Can I plant bulbs outside and just leave them in the soil all year or do they need to be dug up each year?? The contrast of foliage textures in your windows makes the observer’s eye pleasurably wander ’round and ’round. It’s such a welcome shot of green when the back yard view affords only blinding white. Two days ago I tossed my paper whites. I have SO much plant material, but I still felt bad about those spent bulbs thudding into the trash can. I need to learn to be more pragmatic. Your post is very timely. I love your pictures of my favorite flowers! Unfortunately (for this flowers only, not for me!) I live in sunny Florida where it is hard to achieve anything below 75 F. Somebody recommended the bottom drawer of the fridge, what do you think? Thanks – this was helpful. After a kitchen remodel I tucked my build vases away and completely forgot them. Your photos reminded me to go find them so I am ready for next winter. This fall there was to much put door planting to worry about inside color. Love the glass shelves in your window. I like the extra level for growing plants. So curious about your window shelving. You’re certainly an inspiration to the soul with your love of everything beautiful and your indoor winter gardens are just amazing. I’m believing that would be the solution for the winter blues having all those wonderfully scented bulbs flowering around the house. 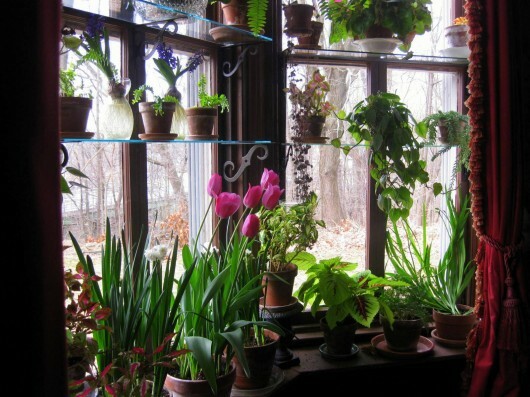 Hi Sheila – You can read all about the glass shelving in this post o’ mine: Steps to a Window Garden. Thanks, great info,very helpful indeed. I will get more bulbs now when I know how and what. Thanks for such great information , you gave me the push I needed to try again. Kevin Do you take your own photography? It’s outstanding. Hi Pat – Yes, I’m responsible for all the food and garden photos on this site. Thanks for asking! Wow KEVIN, you sure are a jack of all trades’s. And you do everything beautifully your recipes are yummy the gardens are glorious and your photos outstanding. What can’t you do? Thanks for your blog. I enjoy reading it especially Sunday mornings. Hi Kevin, Someone gave me potted Rose Tulips last Easter and I planted them outside under a tree in the fall. Should I not expect any blooms then this first year? Thanks for sharing all your tips. Your web site with all of the information is wonderful. Your beautiful flowers are amazing too. Thank you. I’m in Northern CA. I’m in No California now and spent this lovely, sunny day planting a bunch of yellow primroses, all in full-bloom – a real “sparkler” to perk up this time of year after the gray, raining days we’ve had. (We need the rain – no complaints!) They’ll keep blooming into summer until it gets too hot here. I know I’m a couple years late to this, but thanks for the info. Succinct and perfect. Thank you for the useful information and beautiful photos. Thanks for sharing it with the rest of us. I have some tulips from last Valentines day that were forced and have long sonce passed. I read instructions from another source and let them dry out, cut off the old foliage , and left just an inch or less of stalk sticking out of the soil…and left them on my counter, forgetting them. Now, part of the kitchen counter display, I decided I better re-read some instructions. They have dried out well but at warmer than ideal temparatures, so I will now move them to our dark, cool basement tool room until fall and will try planting then. Nothing to loose but 10 minutes of time next autumn. My church gave me all the bulb plants after the had dried out. They are hoping I can use them next year or in the future. I read ur article, but wasn’t sure that since they are dry if it’s too late. Hope you can help. You say keep the still green foliage in full sun, max 65 degrees. I have no idea how to do this. I don’t live in a cold climate-when we’re in full sun we can get up to 100 degrees. Any alternatives? Sylvia G.
This year I have remembered to purchase Holland bulbs and reread your instructions on how to enjoy these flowers indoors during the long winter months. Thank you for everything you share in such an entertaing and colorful way. (pink blooms) whilst other colours bloomed fine – weird? Will do as instructed and plant outside this Autumn. Many thanks Paul, Portsmouth UK 14/02/2017. I have some tulips,that are Walmart specials ,,given to me and I immediately planted them in the ground. BUT, they look so poorly and the leaves are yellowish- green. I planted atleast 8 in. and the soil is freshly turned and fertile. We had a hard frost but they we covered well, I thought of pulling them up and planting in a pot but I am SO UNSURE. PLZ HELP TY IN ADVANCE! As many others have posted, so glad I’ve found your site. Was looking how to split ferns and found your article. Then remembered the bulbs a friend told me she had thrown in the garbage when they finished. I made her dig them out and give them to me.. lol. But I wasn’t sure just what the steps were to put them in the garden this fall. Pure luck – I did know to let them dry out. But I did not put them in another dry medium for the summer, although they are in the dark barn. will be planting them in another couple of months (Sept/Oct) and am just hoping they will bloom in the spring. Should I water/fertilize them in the fall when I plant them? Hi Gwenyth – Spring is the most important time to feed bulbs, but you can certainly provide food at autumn planting time, too. Good luck with your rescued subjects! I saw several answers when I put this question to the internet and most differed in some way. I couldn’t decide which was the best. As a very long time gardener, but first time indoor forcer, I chose this site because it makes the most sense to me. I liked the way it was to the point, without unnecessary or confusing rambling text. I appreciate your knowledge and the time you spent putting up this post. I put in my “favorites” for future reference and enjoyment! Hi Teri – So glad this post was useful to you. Yes! Very educational. I can’t wait to start planting bulbs in the summer. Until then, I’m forcing bulbs and had no clue how to maximize them. Do you have a preference of soil or combination of mixes you use when you force? Also, I have a basement but it is heated, garage and shed are too cold, we live in CT. Where do you suggest leaving your hibernating bulbs through the spring and summer? My dad use to always put a layer of sand in our tulips beds and they would come back every year. Forcing bulbs in water is gorgeous and my kids love it. Our little science experiments, so thank you for the info on tossing them after I force them in water. Thank you so much for all the info you share. And even when things don’t always turn out as planned…lol. I followed your instructions to force hyacinths this year and was pleasantly surprised when they bloomed. I live in NW Ontario Canada. Our temperature this a.m. was -32f! So having the little bit of spring has been awesome. And, now that they are fading here you are again with the answers I need. What would I do without you? Thank you for that excellent advice. I live in Queensland Australia, and hope to do some bulb planting both forced in water/pebles and also in soil. I am not sure how well this will work with our temperate temperatures. Hopefully the air conditioner will help. I have not been able to find out how long these bulbs actually display their flowers for before dying off. What a great article. Simple advice and thorough steps. Have four pots of tulips and will give it a try. Thanks. 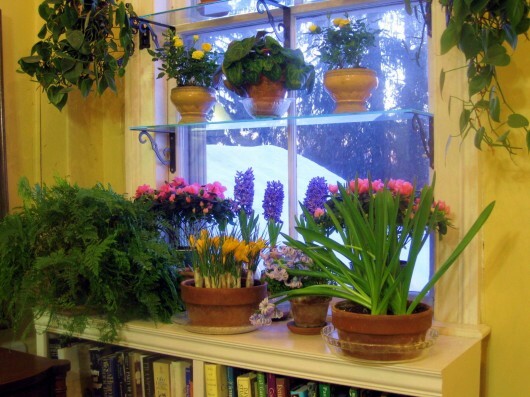 Hi Diane – You might like to do what I did several years ago, and turn at least one of your windows into a garden — complete with glass shelves. (Click here for the how-to.) Indoor forcing takes a lot of energy out of bulbs. Not sure if yours will bloom for two consecutive years without any outdoor recovery time. Bulbs dug from your parents’ garden should bloom at least once if you pot and chill them for 12 weeks before forcing (click here for details). I, personally, purchase new bulbs each autumn for indoor forcing. Hope this was helpful to you! I was just wondering about how to do this very thing – and presto, you have the answer. I forced a variety of bulbs in soil – the scent of hyacinths is one of my favourites – and now I’ll be able to save them for the autumn. Thank you! Very useful details ! I always appreciate how get to them in just few short sentences !!! I was given lillies planted and ready to be forced in a basket for Christmas, they are glorious and prolific. The instructions indicated that they could be processed as you described, and then reforced to bloom again next winter in the home. Do you think it’s possible for these lillies? I’d prefer to do that again if possible rather than plant them in the yard. It has been wonderful to have blooms inside during January and even up to Valentine’s day this week. I have actually had water forced hyacinths rebloom in the garden the following year…not very big blooms, mind you, but they did. Once I bring them Into warmth I top up the water with my houseplant water which is a very dilute solution of fertilizer and keep them growing until they naturally die down. Sometimes I plant them out in spring , by then the foliage has died, but I can see where the garden bulbs are, and other times leave them for fall planting. As usual, excellent advice… inspiring pictures and jolly text. Do love your Sunday offerings. All I can say is I fell in love with your Daphadil, Narcissus ‘Erlicheer’ . I can’t wait to get this into my garden! Do you have a place that you could recommend for purchasing bulbs? Thank you for your very informative article. 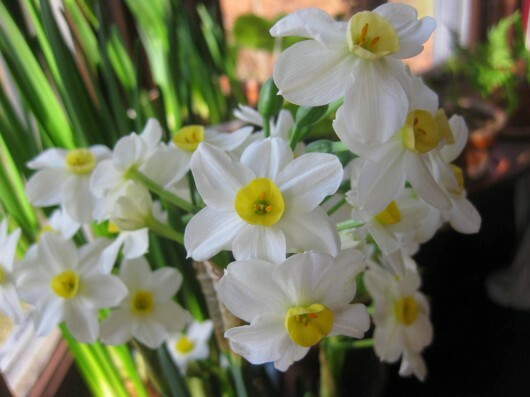 Hi Ana – If memory serves, I purchased Narcissus ‘Erlicheer’ from Easy to Grow Bulbs (www.easytogrowbulbs.com).